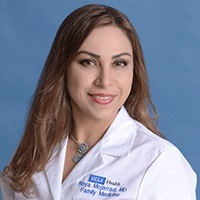 Dr. Roya Mojarrad is board certified in Family Medicine. She earned her medical degree and completed pediatric residency at Shahid Beheshti University in Tehran, Iran before moving to the United States. Dr. Mojarrad then completed her second residency in Family Medicine at Indiana University and worked for many years as a family physician. She sees patients of all ages. Clinical interests include: chronic and acute disease, preventive care, sports medicine, infectious disease, women’s health, adolescent and pediatric care. In her free time, Dr. Mojarrad enjoys spending time with her family and travel.